People with borderline personality disorder (BPD) are more likely to have trouble with their self-image, experience intense feelings like anger, dissociate from reality or their identity, feel depressed or anxious for several days, enter into unstable relationships that may enhance negative moods, and participate in risky behaviors. All of these issues can lead to substance abuse, to self-medicate mood or because it is impulsive. When a person has both borderline personality disorder and trouble with substance abuse or addiction, they have co-occurring or comorbid disorders. Substance abuse is common among people with BPD. Additionally, people with BPD are more likely to struggle with polydrug abuse, ingesting multiple drugs at once to change or enhance the high. While about 1-3 percent of the adult population has been diagnosed with borderline personality disorder, people with a personality disorder including BPD are much more likely to develop a substance use disorder and represent the majority of people who struggle with these issues and enter treatment repeatedly. For example, one survey found that people with borderline personality disorder represented 40 percent of people who sought buprenorphine to help with opioid addiction treatment. About 50 percent of people with BPD self-report a history of prescription drug abuse (about 9.2 percent). A different study found that over half of people with a lifetime diagnosis for BPD had a diagnosed substance use disorder in the past 12 months; similarly, the study also found that 9.5 percent of people with a lifetime diagnosis of addiction also had BPD. Yet another study found that 62 percent of people with BPD in the long-term study met the criteria for substance abuse when the study began; within 10 years of the study’s follow-up though, 90 percent of these individuals maintained sobriety for at least a two-year period, which is considered remission of the addiction. However, people with BPD, even when they had periods of remission within the decade after the study was conducted, typically experienced relapse of their addiction. About 40 percent of study participants relapsed into alcohol use disorder while 35 percent relapsed into drug abuse. In the group, there were few new or different addictions that appeared, but 21 percent developed a new addiction to a drug while 23 percent developed a new addiction to alcohol. The two most common substances of abuse among people with borderline personality disorder are tobacco and alcohol. Lifetime prevalence in the US is around 57 percent for nicotine addiction (usually smoking) and 64 percent for alcohol addiction. Because the symptoms of borderline personality disorder include risky and impulsive behaviors, as well as extreme moods or emotions, it is more likely that a person with BPD will develop an addiction or substance abuse problem rather than the other way around. However, drug abuse could trigger BPD, and substance abuse will make BPD worse. Treating comorbid BPD and substance abuse can be difficult. Because of the likelihood of polydrug abuse, prescription drug abuse, and addiction, using pharmacotherapies like buprenorphine can be tricky and require intense oversight from medical professionals. Like all addiction treatment, detox and rehabilitation together are the best options for overcoming the addiction. 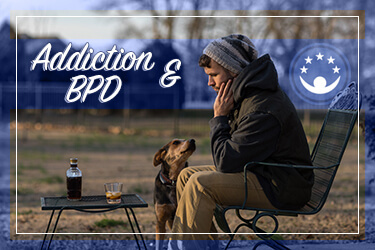 It is important to treat both the substance use disorder and BPD concurrently. The National Institute on Drug Abuse (NIDA) recommends Dialectical Behavior Therapy specifically for people with BPD and a co-occurring addiction as a specific type of behavioral therapy. Additionally, a vocational counselor can help redirect the individual’s focus to developing new skills and employment potential. There are no psychiatric medications to treat BPD specifically, although some mood medications like antidepressants may help to alleviate anxiety or aggression. Most importantly, working with medical professionals and therapists to overcome the substance use disorder alongside the symptoms of borderline personality disorder will help the individual focus on maintaining their sobriety.